This Crab was eight Inches long, the Eyes when extended from their Sockets a full Inch in Length, on each Side of the Eyes was a short Horn, from the Nose proceed two Pair of Feelers, one Pair much shorter than the other and forked at their Ends, on each Side of the Mouth are a Pair of Pinchers or short Claws. 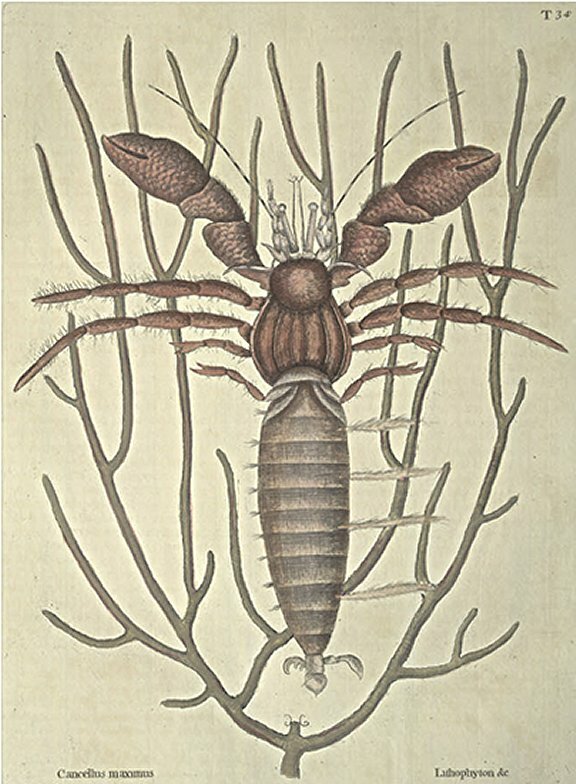 It had two large scaly Claws alike in Size and Shape, having three Joints in each, the Head, Legs, Claws and Fore-part of the Body crustaceous; the Hind-part, which is the larger Part of the Body is of a tender flesh Substance, and covered with only a thin Skin, the Head is large and round, the crustacious Part of the Body short With six Ribs running Lengthways of it; a small semi-circular Shield crosses the Body at the joining of the crustacious to the tender Part; from under which and on the Back of the Fish grow two small Legs with four joints each, and forked at the Ends, a little above which grow two more such like Legs of three Joints each, above which are four more, two of a Side much longer and slenderer, having five joints a-piece; all these are set with briftly hairs. The fleshy Part of the Body is divided into eleven Parts or Joints by ten circular Membranes or Rings; it tapers and grows very small towards the Tail, which is again crustaceous: Out of it arises three crooked Claws beset with Bristles, by which the Creature holds it self fast in the Shell it hath chosen for its Habitation, by hooking these Claws into the small Turns or spiral Cavities thereof, from one Side of the fleshy Part of the Body arise four Tufts of Hair, somewhat resembling Feathers, each about two Inches long, and on the other Side are 10 or 12 small short Tufts of Hairs. These Crabs inhabit the Shells of the Buccinum magnum variegatum, Lister 359. N 12 they abide in the shallow Parts of the Sea, near the Shores of the Bahama Islands, and like the Land Hermit Crab, get into those Shells only that are empty, not dispossessing any Fish of its Shell, and therefore have been improperly called the Soldier Crab.